Godan is the Japanese word for 5th Dan - that is, 5th degree blackbelt. I earned mine this past weekend during a three-day "Summer Camp" for Jujitsu blackbelts in Los Angeles. Ever wonder what black belts study during annual re-tread training? 1. Flashlight techniques - Because police and prison guards use a flashlight as both a tool and a self-defense weapon. Used correctly, it beats the heck out of a knife as a weapon in a confrontation. Literally. 2. Ki for the Western Mind - what IS The Force, really? 3. Reviewing Big Book Techniques Part III - There are some 830 different Jujitsu Kata (discrete techniques) listed in the notes of George Kirby, the 10th Dan head of Budoshin Jujitsu. We worked through about 10 of these in two hours, repairing things like "...place left foot under the attacker's throat..." where it should be "right foot" in the written descriptions. 4. The Science of Throwing, Part I - Why do some Judo throws magically work while others appear clumsy and ineffectual? Hint: the key (Ki) is the axis of where the feet are pointing. 5. What to Do When Things Head South (I taught this session) - When does Jujitsu change from a defensive martial art to a survival martial art? An interesting statistic: 75% or more of 4-on-1 fights end up in death or permanent injury... usually from the head-stomping at the end. The Giants fan attacked in Dodger Stadium a few months ago is a case in point. Knowing that statistic, how would you adjust your handling of a developing assault? One of my sons (Cory) is alive today because in a dicey evening situation in Blacksburg, VA, he happened to be carrying his ASP baton... that was a 6-on-1 attack, and the six were Rugby players who had been experimenting with massive doses of steroids. 6. Momentum and its Application in Jujitsu - This is the Art (Jutsu), after all... so dealing with a frontal attack should involve the smallest use of muscle power possible. Linear attack? Circular response, and vice versa. 7. Reviewing Big Book Techniques Part IV - Know six different ways to take down someone grabbing your lapel (or chest hair)? Here are two more. So you've dropped your attacker on the ground? How do you keep him there (three more)? 8. The Science of Throwing Part II - The throw still isn't working right? The attacker is resisting your efforts to flatten him? Several things you can do to physically (and mentally) unbalance him. 9. 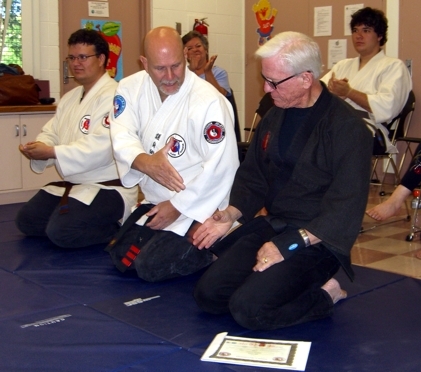 Black Belt Testing - A young guy earns his first black belt during an hour of ferocious testing. Two old guys add a stripe each to their belts. It takes typically 3 - 5 years of continuous study and practice to earn the Shodan (1st Degree blackbelt). It takes a minimum of 4 years to go from Yodan (4th Dan) to Godan (5th Dan). These are really earned. 10. Reaction Time Drills - How do you teach your students to deal with the unexpected? These clever (and increasingly dangerous) drills will give them confidence. For the Senseis taking this training: how do you make sure that no one is injured in what is easily the most dangerous non-weapon martial art? The good news: I made it from Santa Clarita to pass TSA security at the Burbank airport in 50 minutes. The best news: I returned home with no significant injuries. That was the name by which my mother and uncle called their maternal grandmother. Her real name was Mamie Ross, and she married Frank Charles Smith. Sometime around the turn of the 20th Century, they were living with their two toddlers in Kernville, CA, where Frank had found work in a mine. As my mother tells the story, Frank came home one night and, quite drunk, said "Mamie, we have to move out of the house. I gambled it away tonight." Mamie (Gragga to most everyone) said to him what at that time was a pretty bad word: "Frank, you are an old piss-ant." With that she grabbed the two toddlers, what clothing she could, and dragged them all the way down to the Kern River. With rope she tied the two children so they wouldn't wander into the river (which to this day drowns up to 7 people a year). She returned to the now-forsaken house and dragged everything she thought she would need: pots and pans, blankets, etc. With that crucial step completed, she built a lean-to for shelter, all before the Sun rose in the east. For the next several months, Mamie would feed the children in the morning, tie them with ropes to a tree, and walk into Kernville. There she would load her arms with the dirty clothes of the miners and return to the river, where she would wash them in the shallows with stones and sand, and lay them out to dry on rocks. With her meager earnings from this labor, she carefully saved up a nickle at a time and kept it in an old coffee-can buried in the dirt floor of the lean-to. Such was life for my great-grandmother at the turn of the 20th Century. One day a mine owner approached her and said that he had noticed her industrious character, and had a deal for her: if she would cook and run a boarding house for miners that he had just built, she could have free room and board and a small profit after that. She agreed. Several months later a delegation of the righteous ladies of Kernville approached the boarding house on a Sunday morning and knocked at the door. Mamie answered. The leading lady told her that they had decided, as upright ladies of the town, that the circumstances of Mamie's two children were unacceptable: that their mother was unmarried and living in a boarding house with miners - an unacceptably immoral life. They were there to take the two toddlers and raise them in a God-fearing manner. "Is that so," said Mamie? "Just a moment, I'll be right back." She returned with the largest meat-cleaver in her kitchen and said, "The last one of you ladies to get out of this yard will have the back of her bodice chopped open." She reported years later, with some amusement, that you would never believe that women in full hoop skirts could clear a picket fence so fast. Long after that Mamie married a man I vaguely remember as "Uncle Joe." Frank Smith by this time was a cowboy working on the huge Walker Ranch east of Kernville. He came down with cancer, and Mamie and Joe took him into their home in Bakersfield and cared for him until he died. That says even more about her than the experience surviving beside the Kern River. In my genealogy I count Conan Prince of Wales, Humphrey de Bohun who signed the Magna Carta, and Charlemagne, among others. I'm proudest, however, of Gragga, and have made sure that all my kids know her story. I've just been reading an issue of Scientific American, paying closest attention to those things I find most interesting: an article about how 10,000 years ago humans began to domesticate plants - and thus it became possible to live longer. The down-range consequence? GRANDPARENTS, with all the cultural survival memories - and increased survival for the grandchildren - that this entails. Another article discusses the Multiverse concept: that we live in just one of an infinite number of universes, and this one just happens to have the physical constants all perfectly aligned to support life. Given enough time - and enough food - mankind can come up with a lot of great ideas. Art. Science. Ways to waste time playing games or blogging. In another earlier blog, I pointed out that concepts like a Multiverse - or for that matter String Theory - are absolutely unprovable. This particular cosmology article (August 2011 issue of Scientific American) took the time to actually point out why they are unprovable: they are concepts, ideas - not theories. They start and end with circular logic. A scientific theory is a fully-developed and self-consistent concept that is also consistent with observed physical facts. It already works. It goes beyond a theory when, like evolution, it can be shown to predict into the future, or explain things that someone hasn't yet reported. The Theory of Evolution isn't really a theory anymore - it's just Evolution. It has been repeatedly tested at widely different scales of size and time, and found to be consistent with observed facts. I've actually personally watched evolution in Venezuelan rats, and in mice left by a Spanish ship anchored in southeast Alaska over 400 years ago. Interestingly, in Wikipedia you can find just Evolution, not the "theory of Evolution." Evolution doesn't threaten my faith, it augments it. Like Harry Reid said, "I'm a Democrat because I'm a Mormon." So why worry about these sorts of things? Our ancestors millennia ago didn't have the luxury to do so - they were too busy farming or hunting down the next meal. WE have the luxury of thinking about these things (and getting some minor, temporary fame by writing articles in Scientific American) because we have plenty of food and comfortable housing. Unfortunately, a majority of our brothers and sisters in the United States (and a supermajority beyond its frontiers) don't have that luxury. They struggle to pay their mortgages and put food on the table for their children. And to what end do they struggle so? Well, perhaps they love their children and don't want to feed them stones. And for the thinkers out here who have the luxury of eating toast and a Klondike as they read SciAm and type out the words of their blog? To what end do they do this? Well, perhaps they want to think that they are more important than a temporary blip on a cosmic wave-function. They don't want to admit their mortality: to admit that they will die and be slowly forgotten with time. That they aren't important. Not even a little bit. You're probably wondering: the color of what door? That's a metaphor that I started using in my own mind years ago. A dear friend died when I was 26 and he was 30. Another friend I met and grew to know at the Cascades Volcano Observatory was a photographer on the side, and his life work had quite a number of doors from all over the world. Each door seemed to be a different color, have its own unique character. Buck Birdeau died of raging diabetes that first blinded him and then destroyed his kidneys. Dave Wieprecht survived a horrific experience in Vietnam - but not the exposure to Agent Orange - and died of the most virulent of the four known versions of thyroid cancer out there. Both ended their lives as what I would call great people - they had reconciled themselves with who they were in this great universe. They had gotten to the point in life when the most important thing they did was what they did for other people. THAT's What is important. NOT the brand of my dress or the existence of a Multiverse. So. What will be the color of MY door? Lung cancer? It took my Dad and his Mom, but I've avoided tobacco like the plague since I was 20. Stroke? It took my Mom and apparently her Dad, but I've exercised and eaten carefully since I was in my 30's. One thing for sure: my door will have a color. As Jim Morrison (the wasted minstrel of my generation) once said, "No One gets out of here alive." He also said "People fear death even more than pain. It's strange that they fear death. Life hurts a lot more than death. At the point of death, the pain is over. Yeah, I guess it is a friend." I'm just interested in what the color of MY door will be, and will I have time to leave messages of love - and admonition - for the kids and grandkids I love so much... and who must follow? I look forward to stepping through that door and going home finally.